Tensions between Colombia’s war crimes tribunal and the country’s chief prosecutor have reached a climax after prosecution officials on Friday “unduly” seized copies of case files and allegedly intimidated a judge. 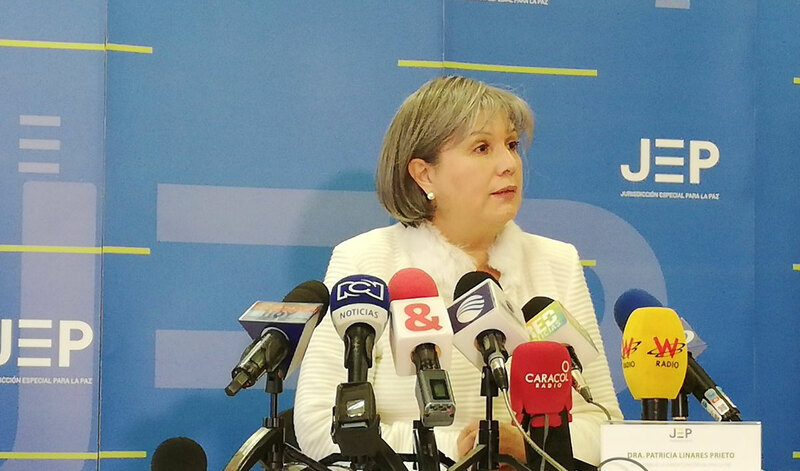 The president of the Special Jurisdiction for Peace (JEP), Patricia Linares, responded furiously and accused Prosecutor General Nestor Humberto Martinez of “outright and categorically undue meddling” with criminal proceedings and even the “intimidation” of judges and employees. Martinez, whose reputation has been tarnished by corruption allegations, reportedly sent one of his most trusted assistants, Majer Nayi Abushihab, to the war crimes tribunal’s main office in Bogota with an order to seize case files and subpoena a judge to appear in his office for a hearing. According to the president of the JEP, Abushihab and other officials “disrespectfully” told the judge she was expected at a prosecution hearing. Taking advantage of the confusion, the prosecution officials were able to make copies of the case files related to kidnapping allegedly carried out by demobilized FARC members, also known as “Case 001,” said Linares on Friday. The Special Jurisdiction for Peace was notified by the Prosecutor General’s Office… of the order to carry out a judicial inspection of case 001 that is handled by this jurisdiction. Likewise, the president of the Chamber handling the case was notified that she would have to respond to an interview in order to report on the progress made. Martinez announced on Twitter that he revoked the order to obtain copies of the case files after they were already in the hands of his office. 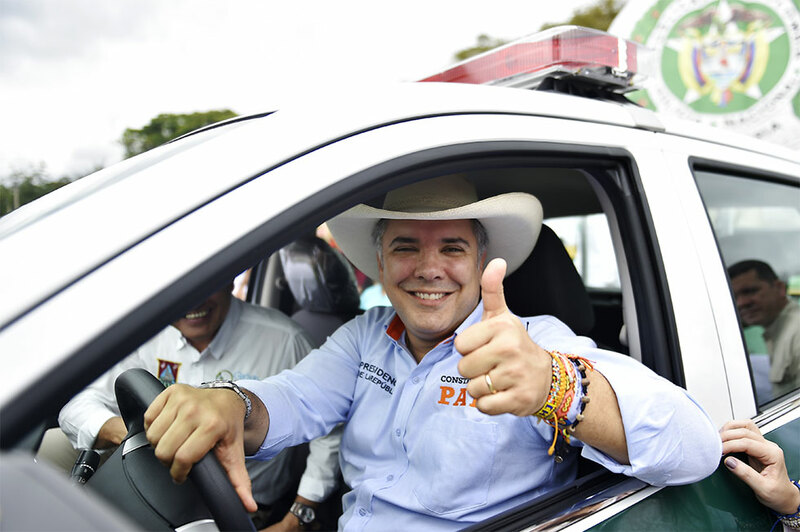 The increasingly controversial prosecutor — Martinez has been tied to some of Colombia’s largest corruption scandals in recent history — also said he would no longer seek to subject the judge to a hearing. 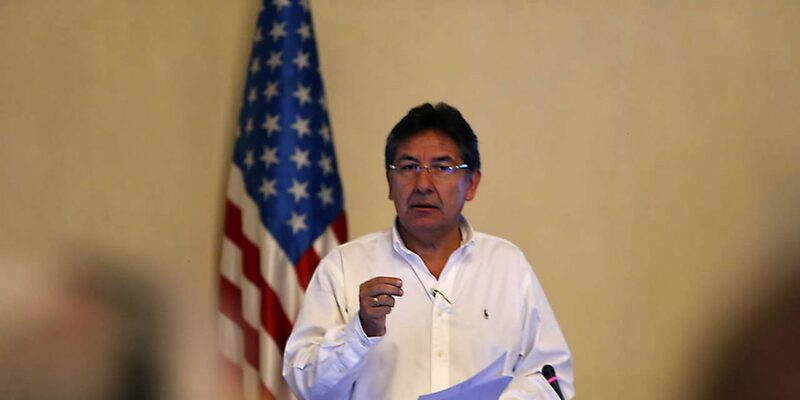 Linares called on Inspector General Fernando Carrillo to investigate the latest incident and take action if necessary. While Martinez backed down, President Ivan Duque supported the chief prosecutor, claiming he had “acted in accordance with the law” and meant to “correct flaws” in the war crimes tribunal. Duque — whose political and economical backers have been implicated in countless war crimes and crimes related to the conflict — has fiercely opposed the transitional justice system for years. What really happened is that some officials of the Prosecutor General’s Office, unduly did not just violate the confidentiality of judicial material, but disrespectfully tried to cite the presiding judge of the chamber. Is Colombia’s state losing its legitimacy? 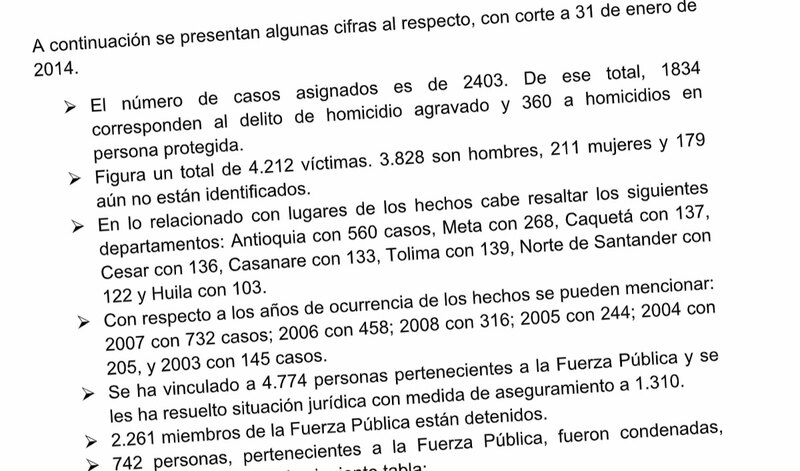 When Colombia Reports requested information on the execution of civilians by the military in 2014, the prosecution said that more than 4,200 Colombians had been murdered and presented as guerrillas killed in combat. Martinez’ office surrendered evidence related to only 2,248 “false positive” victims to the JEP earlier this year. Friday’s clash came on the same day that United Nations mission chief Jean Arnault, who leads the international monitoring of the peace process, informed the UN Security Council that Colombia’s state institutions had become a threat to peace in the country, together with organized crime and other illegal armed groups. On the same day and at the request of Colombia’s Constitutional Court, the UN’s human rights chief in Colombia, Alberto Brunori, advised the court to dump a bill approved by congress and the president that seeks to limit the war crimes tribunal’s ability to investigate crimes committed by the military. The military fought the FARC and other guerrilla groups together with paramilitary groups that were formed by Colombia’s business and political elites. Furthermore, the military executed thousands of civilians in order to falsely present them as guerrillas killed in combat when Duque’s political patron and CD chief Alvaro Uribe was president between 2002 and 2010, . The court began investigating war crimes earlier this year as part of a peace process that has been opposed by Duque for years. His party even ordered the illegal wiretapping of peace talks with the FARC in 2014 in apparent attempts to derail them. The peace process seeks to end more than 50 years of armed conflict between the state and the FARC that has left at least 210,000 civilians dead, 80,000 missing and 7.5 million displaced.